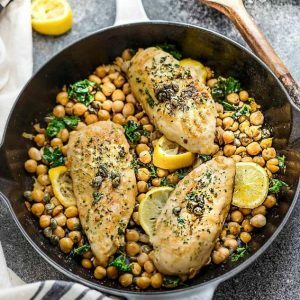 Chicken Piccata – an easy low carb, gluten free one pan meal perfect for date night or busy weeknights. 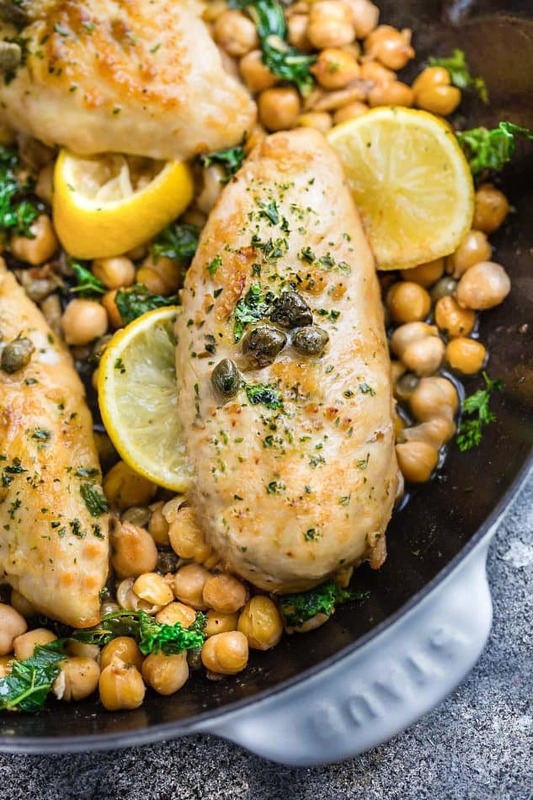 Comes together in just one pan in under 30 minutes with a tasty lemon caper sauce. Plus a recipe video. I am always on the lookout for meals that are quick, simple and packed with flavor. One of our favorite meals we make again and again is this easy Chicken Piccata. We first had this classic Italian dish when we visited Italy on our honeymoon a few years ago. What I love is that it’s impressive enough for a date night but yet pretty easy to make with simple pantry ingredients. The best part though? This Chicken Piccata cooks up in just one skillet in about 30 minutes. The key is to make sure you start off with thin pieces of chicken breasts or pound them to even thickness. Generously season them with salt and pepper then sprinkle a light dusting of flour. I used almond flour to keep this recipe gluten free. Feel free to use all purpose if that’s what you have on hand. Pan fry the chicken until golden and cooked through then remove from the pan. The simple and tasty sauce is made by adding some tangy lemon juice, chicken broth, garlic, capers, oregano and parsley. WHAT SIDES CAN I SERVE CHICKEN PICCATA WITH? Chicken Piccata goes so well with so many sides. To make this a complete meal, you can serve this with a side of rice, pasta or roasted potatoes. As you can see, I added some kale and served it alongside some chickpeas for my family. To keep this low carb and keto-friendly, leave out the chickpeas and serve with cauliflower rice or spiralized zucchini noodles. IS CHICKEN PICCATA LOW CARB AND KETO? Chicken Piccata is a great dish if you are following a low carb or keto diet. Just remember to serve with a side of salad or non-starchy vegetables like spinach, kale, green beans, cauliflower, broccoli or any other leafy greens. WHAT IF I AM FOLLOWING A PALEO DIET? If you want to make a paleo chicken piccata, swap out the butter with ghee or butter flavored coconut oil instead. 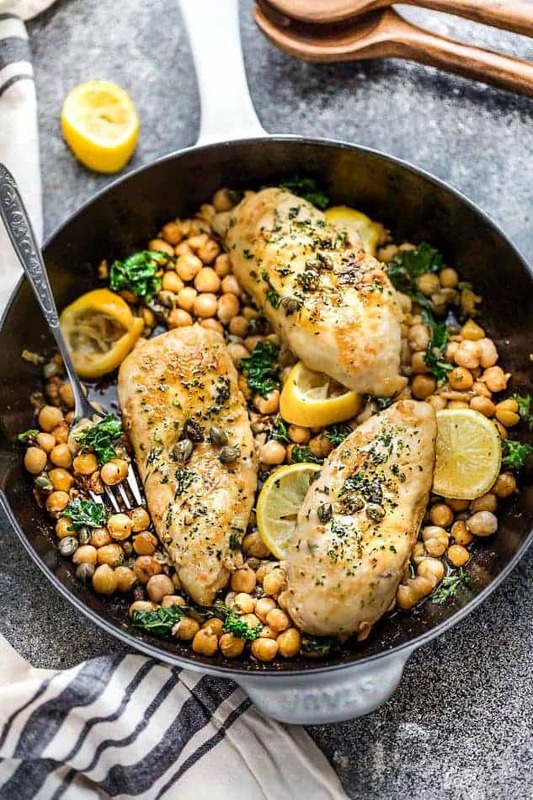 This Chicken Piccata with chickpeas is an easy protein-packed meal perfect for date night or busy weeknights. Comes together in just 30 minutes with a tasty lemon caper sauce. Season chicken with salt and pepper and dust with a light coating of flour, shaking off any excess. Heat 1 tablespoon of the butter along with the olive oil in a large non-stick skillet set over medium-high heat. Add chicken and cook for 3–4 minutes per side, or until golden and cooked through. Remove chicken from pan and set aside. Add remaining 1 tablespoon butter, lemon juice, chicken broth, capers, garlic, Italian seasoning, and paprika (if using) to the skillet. Return skillet to medium heat and bring to a boil while scraping down the brown bits. Add kale along with the cooked chicken back to the skillet. Cook for an additional 2 minutes or until the kale has wilted and the chicken is heated through. Adjust seasonings as needed and sprinkle with fresh parsley. Alternatively, you can pour the sauce over the chicken and garnish with parsley and lemon wedges, if desired. Serve with your favorite sides.